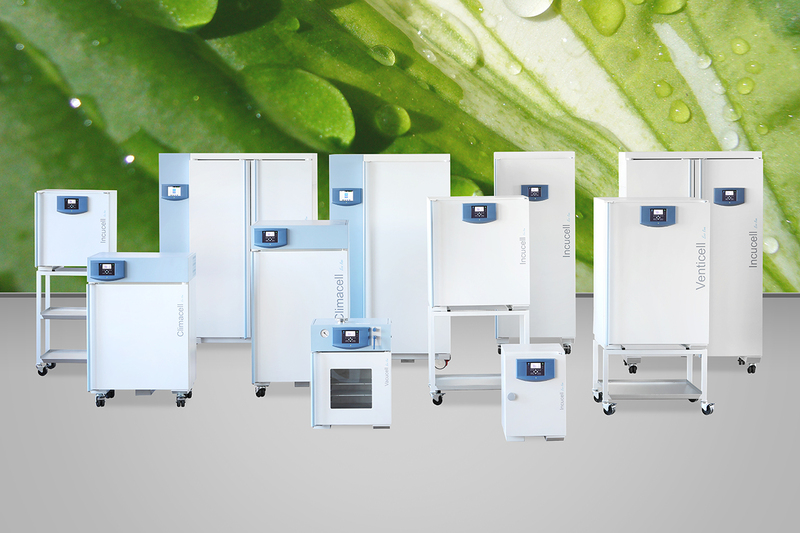 High-tech systems for incubation – both heating and cooling, humidity and light control – intended for use in research, development, production, business activities, or quality control. The sectional principle that applies to the design of laboratory ovens allows a wide range of optional equipment and accessories. The basic model is available – depending on the oven type – in volume size range from 22 to 1212 liters, with either natural or forced air circulation, natural heating and cooling, controlled humidity and controlled CO2 atmosphere. The incubators are produced in two levels of operation comfort – ECO line and EVO line. The parameters inside the unit chamber are monitored and documented with the help of a PC, using a special SW WarmComm (optional equipment). The laboratory incubators line meets the requirements of reproducibility and accuracy of temperature distribution and other parameters in laboratory incubators, derived form such quality standards like ISO 9000 or ISO/17025. Our laboratory incubators comply with the requirements of operation in accredited or certified laboratories. The operation of incubator series INCUCELL is based on soft gravitation air convection in the electrically heated chamber. The devices produce no noise. The double-jacket design of the chamber together with adaptable microprocessor control unit Standard-line (on request: Comfort-line with many additional functions) ensure a homogeneous temperature profile throughout the chamber, exact process course and short recovery times (return to the required temperature) after opening the chamber door. The standard equipment of the devices INCUCELL includes also inner glass door and continuously adjustable air flap into the chamber. Suitable for safe treatment of microbiological cultures. The INCUCELL line produces no noise and provides a very soft air convection within the chamber. These devices can be used especially in biological and microbiological laboratories, duality tests in pharmacy, cosmetics and testing in veterinary medicine and food processing industry. The principle of operation is based on a patented fine air ventilation via fan in an electrically heated chamber. The patented thermodynamic system – thermal screw – ensures creation of a homogenous air stream that spirally rises inside the working chamber. Due to the natural tempering from the bottom up this process simulates nature processes and ensures both an optimal heating of materials and a high precision of the temperature profile in the chamber with minimum energy consumption. Through the system of air convection in the rear and side walls these units ensure a homogenous hot air mixture and an exact temperature profile. Suitable for safe treatment of microbiological cultures. The INCUCELL line produces no noise and provides a very soft air convection within the chamber, the variant INCUCELL V (with a fan) has an advantage of more precise temperature distribution with small deviations. These devices can be used especially in biological and microbiological laboratories, duality tests in pharmacy, cosmetics and testing in veterinary medicine and food processing industry. The principle of operation is based on a fine forced air circulation combined with a patented powerful cooling system situated in the chamber. A unique system of air circulation within the chamber ensures a silent run and a fine heating of samples. A unique cooling system together with a multiprocessor control unit offers a precise and economical simulation of some natural processes and reduces the evaporation of samples. The high technical standard of our FRIOCELLincubators allows exact incubation processes both for variation and deviation. The units have very short recovery times and show an excellent manner in keeping the precise regulation. A unique cooling system ensures, that the samples are not dried while cooling. A high performance system of lighting ensures outstanding homogenous parameters for tests and growth conditions. These devices are desig ned for use in biotechnology, botany, food processing industry, cosmetics, chemical industry etc. The principle of operation is based on a fine forced air circulation combined with a patented powerful cooling system and a humidifier situated in the chamber. A multiprocessor humidifying and dehumidifying control system together with a powerful illumination system ensure a perfect homogenous conditions for a precise simulation of some climatic processes. chemicals, drugs, germination studies, plant cell or tissue cultures, insect cultures. This devices offers an interesting alternative to expensive testing chambers and testing rooms. Microprocessor/controlled humidity assembly with powerful lighting system are warranty of excellent homogene parameters for tests and grow conditions. The principle of operation is based on a fine gravity convection of operating gas in an electrically heated chamber at a high relative humidity and a preset gas concentration. A unique system of chamber and door heating eliminates the need of a fan and in this way reduces the risk of mutual sample contamination resulting from vibrations and from the forced operating atmosphere circulation. Operation with the CO2, event. O2 and N2 atmosphere is possible. The series CO2CELL is suitable for research and growth of cell and other cultures and it is also frequently used in the sphere o IVF. The unique system of the chamber and door heating eliminates the need of fan and thereby the contamination risk for samples caused by vibrations and forced circulation of the atmosphere. The series CO2CELL allows the operation both in the CO2 atmosphere and with O2 and N2. The operation of the CO2CELL incubators is based on the smooth gravitational flow of the operation gas in the electrically heated chamber with high relative humidity and selected gas concentration. The units’ operation is noiseless. As a standard the protective CO2 atmosphere is used, according to customer’s wishes also O2 or N2 can be applied. The CO2 concentration in the chamber is detected by means of an infrared sensor with the automatic calibration cycle. The units are provided with a standard (with LED display) or comfort (with graphical LCD display) microprocessor control unit.